This seems to be a year when seasons and holidays sneak up on us. Just yesterday, we were hit with the first blast of snow here in New York, snarling roads and surprising even the weather forecasters with its intensity. Next week is Thanksgiving, occurring on the earliest possible date, given the federal law that requires it to be on the fourth Thursday of November. Among the many special things about Thanksgiving are that it has always been notable for its message of friendship and inclusion and that it is celebrated by all of the cultures that make up the American melting pot. 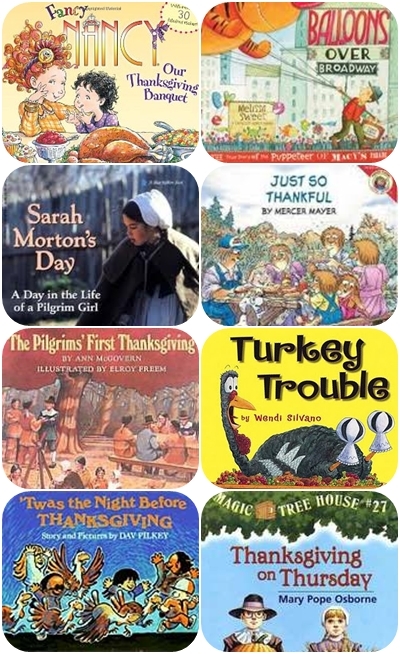 If your family tradition includes sharing books with the children at your Thanksgiving dinner (and if it doesn't, it might be a good year to start), there are a few books you might want to consider. 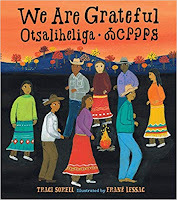 We Are Grateful: Otsaliheliga is a new picture book that was written by a member of the Cherokee Nation. 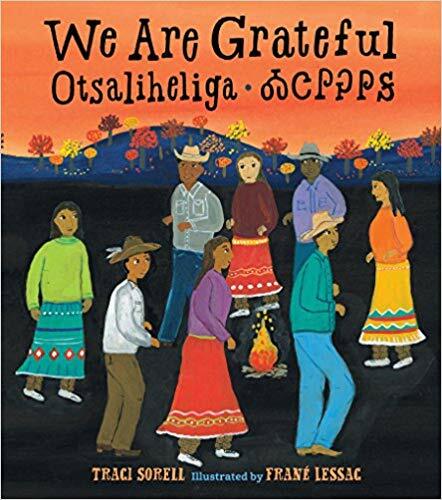 It looks at how the Cherokee people express gratitude - otsaliheliga (oh-jah-LEE-hay-lee-gah) - throughout the year in their celebrations and ceremonies. If your family likes the Macy's parade, they might especially enjoy reading about how it got started, in Melissa Sweet's , Balloons over Broadway: The True Story of the Puppeteer of Macy's Parade, which tells the story of the parade and the man who began the tradition in the 1920s (ages 4 and up). This classic chronicles the struggles of the pilgrims during their first year at Plymouth Colony, their friendship with Native Americans like Squanto, and the first, three-day long Thanksgiving celebration. Fancy Nancy helps her family prepare for a fantastic Thanksgiving meal, with all her usual flair. Comes with stickers! A terrified turkey attempts to disguise himself to avoid becoming Thanksgiving dinner in this silly story, complete with a happy ending. In this zany rewritten version of ’Twas the Night Before Christmas, children on a school field trip to a farm are troubled to learn about the impending fate of the turkeys they meet there. This funny story, full of Pilkey’s trademark humor, is sure to please both kids and parents. Jack and Annie travel back to the first Thanskgiving Day in 1621, where they learn about life in Plymouth. Through a series of photographs taken in a recreated colony, Waters teaches about the lives of the Pilgrims and the Native Americans. We hope you enjoy sharing these books -- and being together with family and friends. Happy Thanksgiving!